Becky Quinn is a Professional Certified Human Resources (PHR) executive with over 20 years of comprehensive human resource experience. She is a woman of many skills, talents and interests — all of which have led her to the career position she holds today with Quality Controlled Manufacturing Inc. (QCMI). As the Human Resource Manager of QCMI, Becky brings a wealth of experience to the Santee-based precision machining manufacturer. Her leadership embodies the company’s vision to be a world class organization in: customer service; innovation; integrity; workplace growth; and the relentless pursuit of continuous improvement. Born in Annapolis, Maryland to a Navy family, Becky quickly learned how to adjust to change and build new relationships as the military family moved from the east coast to Hawaii and on to Bremerton, Washington. Upon marrying a Navy man from Wisconsin in 1984, the couple moved to San Diego where they have raised three children. Prior to joining QCMI in March 2011, Becky pursued her career in human resources at Union Land Title Company, ITS Corporation, and Crest Beverage Company. 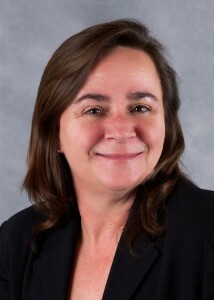 Becky served as Vice President of the San Diego Industry Liaison Group (2007-2009). The organization helps employers work together to understand and implement EEO and Affirmative Action initiatives. She is a 14-year member of the National and San Diego Chapter of the Society of Human Resources Management (SHRM). Becky was also a member of the San Diego Recruiter’s Roundtable. Community involvement programs fueled by Becky’s passion to care for others have been coordinating and sending care packages to our troops stationed overseas; and organizing and participating in the local American Cancer Society Relay For Life. It takes a people person with intense attention to detail, strong convictions, and keen sense of fairness to excel as a HR manager. In her role at QCMI, Becky works directly with the executive team to drive key business growth initiatives. Her responsibilities include recruiting, new hire orientation, employee relations, benefits and training. In addition, she handles the company’s corporate communications. In this role, Becky manages QCMI’s public relations efforts, community involvement and awards submissions. Quality Controlled Manufacturing Inc. specializes in providing a full spectrum of machining services from general to complex precision machining of all metals including exotic alloys. Some of the industries it manufactures components for are aerospace, power generation, Department of Defense (DOD), oil and gas, marine, and heavy equipment. As one of the nation’s leaders in complex machined components and assemblies, QCMI has earned the prestigious United Technologies Corporation (UTC) Supplier Gold status for three consecutive years. In following her pursuit of excellence, Becky Quinn is playing a key role in helping Quality Controlled Manufacturing Inc. “Define the Future in Manufacturing.” Becky is indeed an exemplary woman professional making a difference. Click here to read article online at the SanDiego Source / The Daily Transcript. This entry was posted in In the News, Press Releases and tagged Becky Quinn, Human Resources, PHR, Professional Certified Human Resources, SanDiego Source, The Daily Transcript, Women In Business, Women In History. Bookmark the permalink.